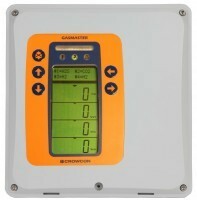 Crowcon’s new Gasmaster control panel has a modular design meaning users only need purchase the required number of input modules. It can easily be extended by adding more modules at a later date. Gasmaster monitors up to four gas detectors or four fire zones, all from a single location. Simple to operate, the large multilingual LCD display shows gas levels from all detectors simultaneously and allows quick and easy system adjustment and testing from the control panel. It can operate as a stand-alone unit or interface with any alarm or visual warning devices and control systems. In addition to standard 4-20mA-type gas detectors, Gasmaster can also be used with mV pellistor-type flammable gas detectors, which are significantly lower in cost than 4-20mA-types as they have no internal electronics. Sensor calibration is performed via the Gasmaster user interface: once commissioned, mV pellistor-type detectors do not need to be accessed until the sensor needs replacing – usually 3-5 years after installation. In addition, power to mV pellistor-type detectors is automatically cut if the gas reading exceeds 95% of the gas’ LEL (Lower Explosive Limit) to prevent sensor damage. Gasmaster provides as standard a wide range of analogue, relay and Modbus outputs and a ‘calibration due’ warning informs the user when a service is due on a gas or fire detector. An IP65 enclosure also means the control panel can be installed in potentially wet areas without requiring the additional cost of high-IP enclosures. 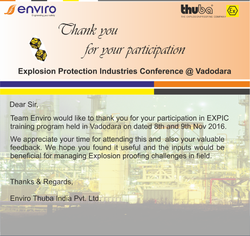 Thanks for participation in ExPIC training program held in Vadodara on 8th & 9th Nov 2016. We would share more inputs which would be beneficial for managing explosion proofing challenges in field.